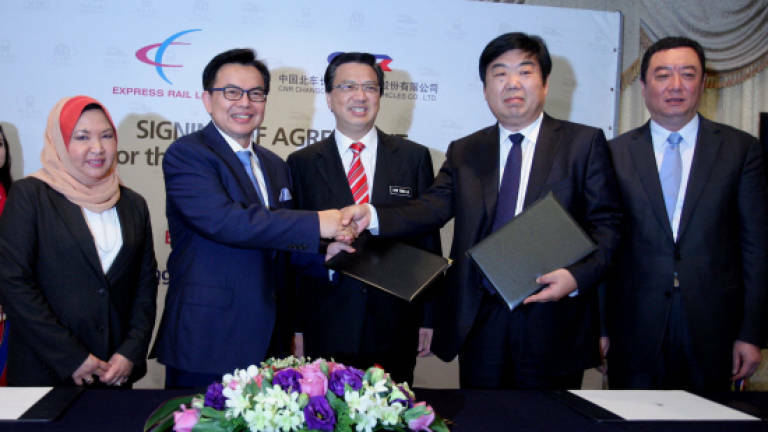 26 Nov 2014 / 05:39 H.
KUALA LUMPUR: Express Rail Link Sdn Bhd (ERL) has purchased six new trains from China-based Changchun Railway Vehicles Co Ltd (CRC) to cater to the ridership growth of KLIA Ekspres and KLIA Transit services, which is expected to hit nine million passengers this year. ERL executive chairman Tan Sri Mohd Nadzmi Mohd Salleh said the daily ridership, which was 19,000 last year, is expected to hit 27,000 this year for both KLIA Ekspres and KLIA Transit. The total number of passengers for both services is expected to be nine million this year, compared with 6.4 million last year. "This is the natural cost of doing business, demand is there and we want to maintain our quality. We don't want congestion to be a problem. You must also appreciate that we need lead times. You have to make booking first and work with the company ... the train that we are using today is no more in production and we have to look for new trains, but it must be compatible with the system that we are using today," he told reporters at the signing of the agreement between ERL and CRC yesterday. He said demand for its services has been driven by traffic to the airports, especially with the opening of klia2 in May this year. "The growth of key townships along our rail corridor has also been a contributing factor as we see more and more people opting to commute by KLIA Transit to work. With the increased load factor, there are certainly a lot of new challenges and business potentials for ERL," he added. ERL currently has 12 trains, of which eight are operating on the KLIA Ekspres and four on KLIA Transit. Of the six new trains, two will be used for KLIA Ekspres and four for KLIA Transit. Each train set will have four cars and will operate at a cruising speed of 160km per hour. All trains will be operated and maintained by ERL's operations and maintenance subsidiary, ERL Maintenance Support Sdn Bhd. Delivery of the six new trains will be made progressively from May 2016 onwards, after which testing will be done. ERL expects all six trains to be operational by November 2016. Mohd Nadzmi said the trains will go through many tests, both at CRC's facility in China as well as on ERL's tracks. The trains will be built at CRC's facility in China. He said CRC was selected to supply the new trains in view of the company's track record, experience and proven ability to provide trains that will meet ERL's requirements and specifications. He declined to reveal the purchase price of the new trains, except to say that ERL will "squeeze to get the best price". "Of course the best price must also be together with the quality and specifications of the train. After going through many bids or proposals from other manufacturers, we found that CRC not only meet our specifications and whatever quality that we want for our train, they also fulfill our commercial targets." When asked to comment on the extension of the ERL line, Mohd Nadzmi said it is "always ready" because it is the first train company to use the standard gauge. He added that ERL is eyeing other jobs and that it is in the best position to offer its services for any project that uses the standard gauge. ERL has also expressed interest to participate in the KL-Singapore High Speed Rail project, in terms of building and operation, and is waiting for the government to call for bids.